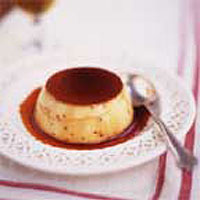 Enduringly popular throughout France, crème caramel is a delicate, set custard, sauced with dark, caramelised sugar. Place the milk and the vanilla pod in a pan and bring slowly to the boil. Turn off the heat, cover the pan and leave to infuse for 30 minutes before removing the lid and allowing the milk to cool. Meanwhile, place 125g of the sugar and 75ml cold water in a small pan. Bring slowly to the boil, swirling a couple of times as the sugar dissolves. It must all be dissolved before the mixture boils. Boil for about 15 minutes, until the liquid turns a dark golden colour. Pour this caramel into 6 dariole molds, ramekins or small cups, of about 150ml capacity. Put the remaining sugar, whole eggs and egg yolks into a bowl and whisk to mix. Leave for 10 minutes or so and then whisk again to ensure the sugar has dissolved into the eggs. Strain the vanilla milk into the egg mixture, discarding the pod. Whisk lightly. Leave for 15 minutes then whisk again. Skim the surface to remove excess bubbles then strain the custard into the moulds over the caramel. Put the moulds in a deep oven dish and pour in boiling water to come two-thirds of the way up the sides of the dishes. Bake for one hour. Remove the dish from the oven, but leave the moulds in the hot water for 30 minutes to finish setting. Leave to cool, then chill overnight. Invert the dishes onto plates just before serving.